I want to start off by thanking everyone for coming by the site this year. Life After Midnight is really just a visual record of products, people, art and music that inspires us. So we thank those of you who have made this your casual or daily reading and those of you who share the same interests. We wish you all the best in 2010. Be blessed. So for New Years this year we decided to make our way up to Saskatoon, SK, Canada to attend the 2010 World Junior Tournament. The tournament is basically an opportunity to put the countries most talent under 20 hockey players together in a 10 day tournament in front of just about every scout in the National Hockey League. Ten countries were represent this year featuring talent from Russia, Sweden, Slovakia, Finland, Switzerland, Czech Republic, Latvia, Austria, Canada and the United States. We witnessed a handful of mediocre games as well as some blowouts that included Canada's 16-0 win over Latvia. However I think everyones eye's were set on the New Years eve game that featured Canada and the United States. 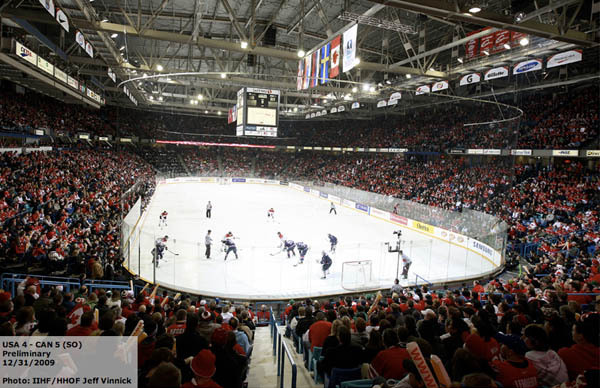 In front of a sell out crowd Canada got out played for two periods. The United States scored two shorthanded goals courtesy of Jordan Schoeder and Tyler Johnson. Johnson's goal came with 11 seconds remaining in the second period and could have easily been the straw that broke the camels back. But thanks to some late heroic efforts at the hands of Canadian forward Jordan Eberle and defenceman Alex Pietrangelo Canada managed to tie up the game during the third forcing an overtime that would resolve nothing. So if front of 15,171 Canadian fans and a 50/50 Jackpot of $190,000 the game came down to a 3 shooter shoot out. Canada and the United States went stride for stride with both teams first two shooters finding the back of the net. Canada would score with third shooter Brandon Kozun and thanks to Jake Allen's save on Jordan Schroeder Canada completed the comeback which through Canadian fans into a frenzy. Here's to hoping the meet in the finals.